Looks like the Gomers have done it again. While not a surprise, the guys are disappointed to have to announce that the Red White and Boom! Half Marathon is not going to work for them this year. Wanna know why, get some details, and hear what is most likely a little more processing about it that you needed? Then this, the first episode in the fourth-and-a-half season, is just what you’re looking for! Plus we talk about Modern Marvels: Beans, fat suits on skinny celebs, and the Kansas City Royals. Or something. Thanks for sticking with us, even when things change. 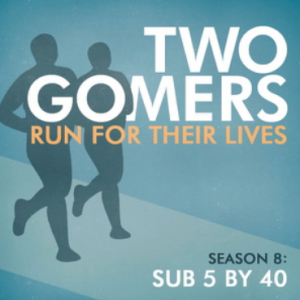 You’ll hear from the Gomers again soon – till then, Happy Running! guys, run individually, if this will be for the long term you can’t always make it work out together. You guys can encourage each other all the way through. Be realistic. Keep it coming! Please don’t beat yourselves up for having to roll with the punches. Running is a sport of sudden game-changing events, whether they’re injuries, unexpected work conflicts, or family needs. That you’re podcasting at all is such a generous gift to our community. We’ll be here! Things weren’t going so well for me during the 10 by 12 challenge, and I didn’t make the PR goal or weight loss goal by 2012. HOWEVER, I made some positive changes and had some great success at my marathon last week. I listened to the podcast, of course, and I joined the Runner’s World Challenge, which was a great experience. This week they featured me on one of their blogs. Here is the link. Hey, it’s a Gomer on the Runner’s World website…soon enough you guys will be on the front page! Sorry, but the link isn’t going through. It is featured on the Runner’s World website on the left under “blogs” and “Runner’s World Challenger of the Week”. I’m a long time listener and am still encouraged every time I listen to your podcast, even more so. To know where you guys came from (couch potatoes) and to see how far you’ve come is very motivating. You both have faced life obstacles just like everyone else which would make it easy to just give up. Instead, however, you just keep getting stronger and moving forward. I hope you continue with your podcast and healthy lifestyles. You, your families and the gomernation will be better for it!! Keep it up gomers! !